When someone has given you inspiration, knowledge and creativity to excel at something, we often say these people are the "wind beneath our wings". Although those words have become cliché, I believe I can use them now without hesitation and with complete honesty when I describe my Mom, Sarah Curci. Most of the important things I've learned in life- about caring, giving, strength and reliance, I've learned from my mother, who taught me invaluable lessons about life and family lineage. I've learned that as long as I have my family I can do anything I set my mind to do. Family stands behind us and offers unconditional love like no one else in our lives. 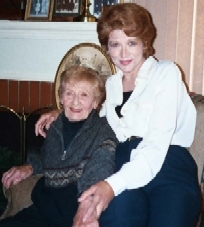 Mom, with her many Italian family stories, was the inspiration for my "Remember When" column that ran for many years in the Willow Glen Resident, and for the hundreds of other stories I've written for newspapers, websites, magazines and books. Through the years, I've come to rely upon my mom as a fountain of endless family histories, anecdotes and generational stories. Whenever I've needed facts, details and dates on the subject of family milestones and histories, it was my mom, the family matriarch, whom I've called upon. Mom's role as the keeper of our Italian American family histories and memories is only a small part of her countless motherly skills and talents which, like most post-war American Moms, included the wearing of many hats. Like most young Italian American brides, mom had to work full time outside the home to make ends meet. One of her jobs was packing cherries at a local cheery packing plant. She earned 5 cents a box and 25 cents a crate. The hours were long and difficult, but, like most Italian American brides, it was enough to help pay the food bill and house taxes. Mom also worked part time at the local dairy plant until she was expecting her first child. Mom's bedtime stores to her children were rarely read from a book. Instead, they were real-life events and adventures from her childhood, adventures that fed my own creativity and imagination. Her nightly yarns were made up of little family histories and stories that today are tenderly recorded in my newspaper column and passed along to each new generation. Over the years, Mom has advised and counseled her family in a way that many psychologists could learn from. Her clever diplomacy and arbitrating skills would leave most political campaigners envious. There were times, as young Italian Americans, when our playmates would call us cruel and unkind names. Mom was always there to soothe my ruffled feathers with just the right words. "Patients and fortitude, she would say, conquer all things." Another of her favorite Italian sayings translates something like this, "Prejudice is like the pupil of an eye the more light you pour into it the more it will contract." Through the years, we've come to discover that money can be lost and property ruined. But what my Mom has so generously given to her family can't be damaged or destroyed. Her love has always been without conditions. And although she may not always have agreed with all our decisions she didn't judge, she just loved us. Thank you Mom, for all the dirty dishes you've washed, the wet laundry you've hung out to dry, the baskets of school clothes you've sprinkled and ironed, the lawns you've mowed and the broken hearts and fences you've mended. Thank you for the countless ways you have given your love, your wisdom, your strength and your words of encouragement. But most of all, my dearest Mother, thanks for always ruling with your head and listening with your heart and for always being there when we needed you. My mom was my friend, she was a warm hug, a voice on the phone that made me happy, a shopping pal that brightened my days. She was a generous smile and tender words that rang with wisdom. She was always there for me for so many years, to fill the voids, to counsel and console, sharing my good times and bad she was an indispensable part of my childhood, and of its beautiful memories that inspired my adult ideals. She lives on now, in that secret, very special place, in my heart reserved for life's most treasured and everlasting love. Dearest mom, your love, devotion and memories will remain indelible and everlasting in the lives of your children, your grandchildren and your great grandchildren. And because you've given each of us a unique part of yourself, years from now, because you've done your job so well, your family will all come to rely upon one another the same way we've always relied upon you.